Find out how Deckhand Riley brings a little bit of customer care know-how to forum moderation. Are you ready for another Community Spotlight? Of course you are! 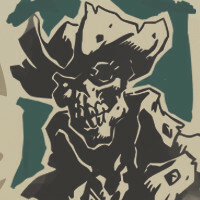 Today we’ll be speaking with Riley, known to everyone on the Sea of Thieves forums as “rmac”, one of the latest additions to our crew of Deckhands who’s here to tell us about his unique outlook on the role and what brought him to the community in the first place. Riley joined the Forums in January and has quickly become a pillar of the community. [A]: For me, like a lot of other gamers, it was Nintendo that first got me into gaming around the age of five with Pokémon Gold on the Game Boy Color, which was the first video game and gaming platform that I owned myself. Pokémon to me was my form of Tamagotchi pet that a lot of other kids at school had at the time, I have no idea why I loved it so much other than the sheer desire to “Catch’em all!”. From there my gaming desire took off when I got my hands on the N64 and played Mario Kart, Donkey Kong, GoldenEye, and all the other nostalgic games from the past. It was not until I upgraded my original Xbox to the 360 to play Halo 3 that I really played online games, back then you had to get the Wireless-N adaptor and anyone who had to get one knows how much of a pain that was. Although my gaming desire started at a young age with Nintendo, I wouldn’t say I was a “gamer” until Halo 3 and the Xbox 360, as that is where the true love for gaming took off! [A]: Well, I can’t say that I was as big a fan as my fellow Deckhand Amir (IOnEI Falcon), as he has the greatest Rare collection in the world that could easily top Rare itself, but I loved playing some of their older games. GoldenEye and Donkey Kong Country were the first games that I played that were developed by Rare. GoldenEye was the game that introduced me to FPS games and I fell in love from there! My all-time favourite Rare game would have to be Conker’s Bad Fur Day (CBFD) as I would associate that whole game with my rebel stage. Being, let’s just say “well” below the age rating on the game, I found a whole new level of fascination with that game that is hard to describe, but it’s similar to having your first alcoholic drink before you’re of legal age. I really just loved the multiplayer for CBFD and played it endlessly while my parents were not around. [A]: Currently I have two ways in which I play games, PC if I’m alone and Xbox if I am with a bunch of my friends. Recently I have been playing a fair amount of Cloud Pirates on Steam with the other Deckhands and a couple Rare Employees when they have the chance to play. More frequently I have been playing NHL a lot with a few of my friends, Overwatch when I’m fairly bored, Prison Architect to just get lost in a game, and Battlefield 1 or Call of Duty depending on how “the boys” feel from day to day. My favourite game however would have to be Europa Universalis IV(EU4), which is a grand strategy game for PC. I can spend days on end playing one save file on that game and somehow still manage to lose to the AI even when I play nearly perfectly. I love the challenge of how many various attributes you have to manage in that game, currently it is hands down my favourite, but maybe Sea of Thieves can dethrone it! Not every pirate needs a parrot for a partner! [Q]: You joined the Forums in January and have already made a big impression on the community. What brought you to the Forums and convinced you to get involved in the way you have? [A]: Most gamers would agree that the months of January through June tend to be the slowest months for gaming, there are really no new releases and you end up just playing the same games you have since the holidays over and over again. For that reason, I started looking at what was coming and stumbled across the website here, thought the game would be amazing for my friends and I to give a try, so signed up right away. I was sent to the Forums after signing up and I felt like I had found my new home. The Deckhands were there to immediately welcome me to the Forums, show me around, and lock my threads that were duplicates as most people have come to find out after joining up! Everyone in the community was so welcoming, open, and just very easy to communicate with. As most people on the Forums know, I love to talk so I just fit right in! Since then I have seen a few threads that have spoken about mental health, and this is where I found out how truly great this community is. I have lost a few friends to mental health issues, and to see the outpouring of support for one another in a gaming community was a completely new concept to me, because in most others you would get laughed at for discussing that kind of topic. I think almost everyone would agree that Rare has done an amazing job centering this game around the amazing community that they’ve built! Long story short, it’s the people hands down! [Q]: Do you feel that working in customer care has influenced the way you interact with other members of the Forums when they have issues? [A]: Anyone who has worked in customer service would agree that it very quickly changes the way you interact with others in any form as it teaches you how to handle difficult situations. On the Forums it’s no different than working in a retail store, you have to listen to what others have to say regardless of whether it’s good or bad, understand where they are coming from and show respect in your answer that you’ve thought about what they’ve said and how they feel. I find that because the nature of my work requires me to always help people, this has spilled over to the Forums as I always just want to help people here too, whether it be before or after joining the Deckhands. It’s just naturally something I enjoy doing in or outside of work. [Q]: As a gamer, is there anything that you’ve learned about the hobby since becoming a Deckhand? [A]: Being a Deckhand has taught me many things already even though I haven’t been here long, and the best I feel is that game developers such as yourselves are literally no different than the rest of us. They have fun, joke around, adore posting GIFs all over the place and of course enjoy games just as much as the rest of us do. I am very privileged to have the opportunity to get to know a lot of the Rare team and can honestly say I have a whole other level of respect for the stuff they do and how open and transparent they are with the entire community! [A]: The dependency on Co-op and possibility of customization, however that will look, must be the top two things I am looking forward to in this game. I have always loved being able to customize various things in games and I hope I can have the most infamous ship among the Sea of Thieves. With regards to co-op, I love that you have to work together to be successful in this game. In other games this tends to fail, but Sea of Thieves has thrived with this motto and I couldn’t be happier. As my good friend Clumsy George said on the Forums, this game is bringing people and generations of gamers together and it is amazing to see! None of us had any clue as to what had just happened or how we died, but we all had a great laugh and shortly after proceeded to the tavern to drink far too much grog even for our notably tolerant pirates! [A]: I’ll tip my hat once again to my friend Clumsy George for coming up with the name “The Canadian Forum Rocket”, but in game I would just simply probably be “Rmac of the Fo’Rums”, courtesy of TheAaronLeigh for the “Fo’Rums” part. I know it’s not really piratey but it has “rum” in it so I guess that’s all that matters! [A]: Outside of gaming I am a huge sports fan, in particular winter sports. I love to play hockey in my spare time and although I am better at Inline Hockey than Ice Hockey I still enjoy playing both. Here in the winter I can’t go more than 5km without having a hockey rink somewhere, mostly being outdoors in the winter, and somehow managed to get the girlfriend to play once. I also love to ski when I can get some time off to make a trip to the mountains for a weekend and get some good time to hit the slopes. [A]: Well, those who have read previous Community Spotlights will know that there’s a certain snake lover on the Forums. A few months ago, my girlfriend wanted to get a snake and I was, let’s just say ‘hesitant’ on the request. Eventually I was convinced to get one and have come to adore snakes myself. Although ours is only eight months old and thus much smaller than Dilly’s, she will get to be the same size as we both have Ball Pythons, just different breeds! I think they’ve made it a requirement that you now need to have a snake to become a Deckhand, or so it seems! As my girlfriend and I both love Harry Potter, we decided that a good name would be “Bellatrix” as she was from Slytherin! Thanks to Riley for taking the time to chat with us and for his great work as a Deckhand on our Official Forums. We're glad to have you on board (pun intended)! Another spotlight will be coming your way in the near future, but until then, follow us on our social channels to keep up to date with all things Sea of Thieves!